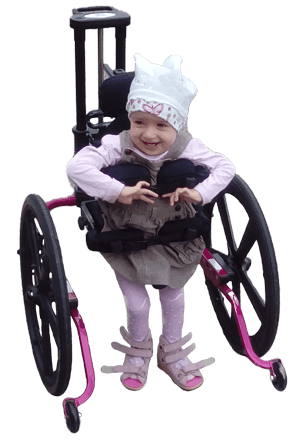 The first year we decided to help two-year-old Maria Kubova from Vikartovce. Thanks to sponsors, runners and volunteers, we collected € 1367, 160 packs of diapers (Paradais Plus s.r.o.) and 5 cartons of dairy products (RAJO a.s.). Thanks to the proceeds of this event, the parents of the little Mary could buy a KidWalk walker, which they were not entitled to from the General Health Insurance Company. Part of our charity run is also the collection of bottle caps for Sabinka. We have kindly asked runners to bring for registrations at least 15 of them. But their desire to help was so strong that they brought together 60kg. The second year we managed to gift 3 persons. 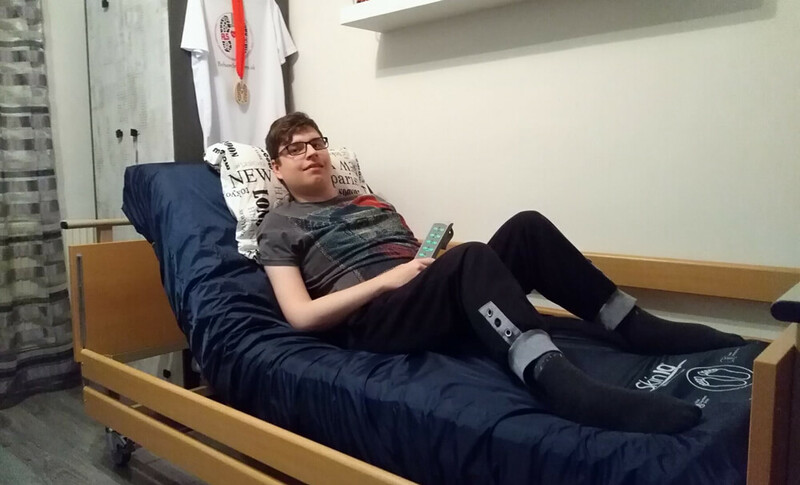 Apart from the little Mary, whom we want to continue to help, we have decided to include two young boys – Darius Renner from Prešov and Radovan Zmij from Trebišov. Beautiful sunny Saturday, March 24, 2018, we managed to collect 4038 € thanks to runners, sponsors and volunteers. 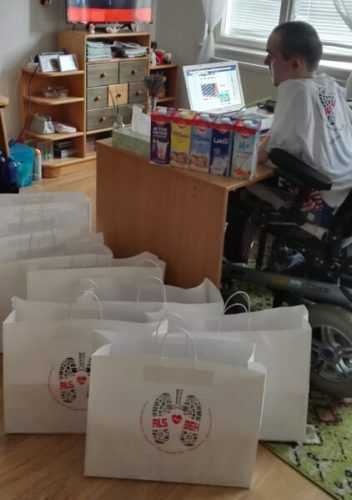 The redistributed amount of € 1346 was sent to the Kubov family to Vikartovce, who used the money for a rehabilitation stay for Mary at the Adeli medical center. Also RAJO a.s. donated to Kubov family 10 cartons of various kinds of dairy products. We got a contact for 22-year-old Radovan Zmij from the Muscular Dystrophy Organization. Radovan wanted a new bed to meet all his requirements. We tried to satisfied him and gave him an electrically adjustable bed with an active anti-decubitus mattress, which redistributes the pressure together with SKI IQ MCM coating, which is designed to prevent decubitus by pumping moisture away, reducing the body temperature. The coating also significantly reduces odor and acts antibacterially. The electrically adjustable bed, including the above-mentioned components and accessories (bars, walkways and mats under the mattress) cost € 1124. 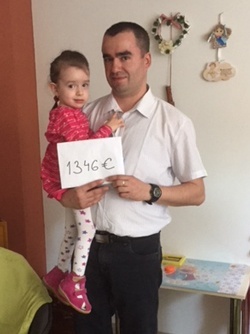 It is worth mentioning the grandeur that this modest family showed when the remaining € 222 that we wanted to pay for them was given for the benefit of the third gifted person – Dárius Renner. The Zmij family also got from RAJO a.s. 10 cartons of various kinds of dairy products. We got a contact for 19-year-old Darius Renner, via social network. Darius wished a shower bed that would facilitate his personal hygiene. For this reason, it was necessary to transfer him to the bathroom one floor above. Thanks to a 1700 € hydraulic showering bed, he will have one less concern and the showering will be much more comfortable. Darius is, as well as our other gifted, registered by the Muscular Dystrophy organization. In this way, we would like to thank the organizations for their cooperation. Thanks for their 136 € co-financing of the bed, which was missing for the purchase. 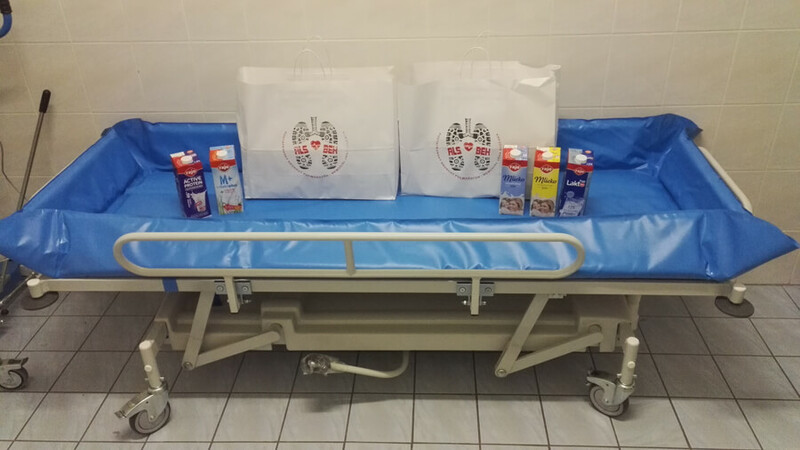 Darius also received 10 cartons of various kinds of dairy products from RAJO a.s .. Together we have collected of plastic bottle caps. Already during the 1st year, we asked the runners to bring at least 15 PET bottle caps for Sabina Fajnor. However, the runners surprised us with 60 kg, resulting in about 120 caps per runner. In the second year we have announced the competition for the 3 best collectors. And the result? We were literally in a shock! The runners took the collection of pet bottle caps so responsibly that only the first three best collectors brought us twice as first year, namely 127kg. 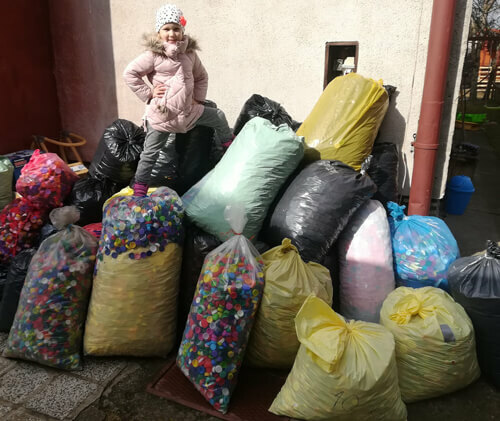 Together with the other runners, we managed to collect more than 200kg of the caps for Sabinka. Even the transport itself (see the photo) was difficult. We handed the caps at the Poprad collection point. Do so at any time during the year. Why to collect bottle caps? I have bottle caps! Where to send them? 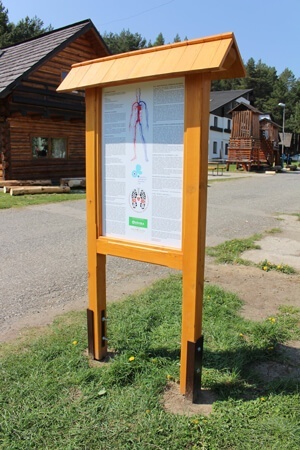 Thanks to the Insurance company Dôvera, we have installed a two-sided information board near to the Svit-Poprad cycling trail (at “Koliba”). On one side of the board there is a map of the race, for those interested in running a half-marathon track. On the other side, readers will find information about the foundation of our organization “Športuj srdcom”. However, the info table is mainly focused on informing about the unique muscular diseases our benefactors suffer and which we are trying to fight by support and donations also in next years. Thanks again to all sponsors, volunteers and runners for support! We greatly appreciate it and we are looking forward to cooperation that can help us to make life easier for people with severe illness. Our idea is, in context of a memorial to a great man, athlete, who was always kind and helpful, to organize a high quality running event. Thanks to it, we want out runners to return with joy every year with great feelings, memories and with intent to help people suffering with one of types of muscle atrophy. The patient is helpless – reliant on the closest family and good people who cares about ill person.